Gabi is Austrian, married, and mother of two young girls. Gabi holds a master degree in European Business Administration and has been working in the IT field for a long time. 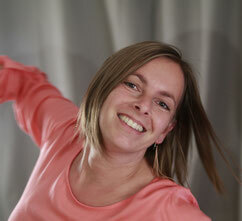 Gabi discovered Biodanza in Belgium in 2012 and immediately fell in love with it. She trained as a facilitator at the Liège school of Biodanza (2013-2016) and has additional qualification in "Biodanza for Children and Teenagers" and "Biodanza for the elderly". An Ethics, Sustainability and Gender diversity specialist, Océane discovered Biodanza in 2006 and has been practicing ever since. She studied at the Liège school of Biodanza in 2008-2011 and completed her training at the Nice school of Biodanza in 2016-2017. She’s been trained in “Biodanza & organizations”, “Radical progressivity” and "Organic poetry". Océane is French, single, happy mother of a teenager.